Join us for yoga inside Tupps Brewery, located at the historic Cotton Mill in downtown Mckinney. This all-levels class is perfect for all ages and is FREE. Stay after and enjoy one of Tupps 5 different beers, brewed right here in Mckinney. Beers are all priced at $5. Join Cheryl as she leads you through a session focused on self-massage through myofascial release using foam rollers and balls to work deep into connective tissue. She combines this work with the deep relaxation of restorative yoga, leaving you with a feeling of relaxation in the mind and body. This session will include tools to use for rolling away holiday stress and attendees will leave with a special gift! This is our monthly FREE master class for members. Non-members and guests: $15. Register on our scheduling calendar. Whether you're Interested in learning the basics of acrobatic yoga or looking to build on to the fundamentals you've already learned, this session is for you. Bring a partner or come on your own and learn how to feel fully supported while suspended in the air. 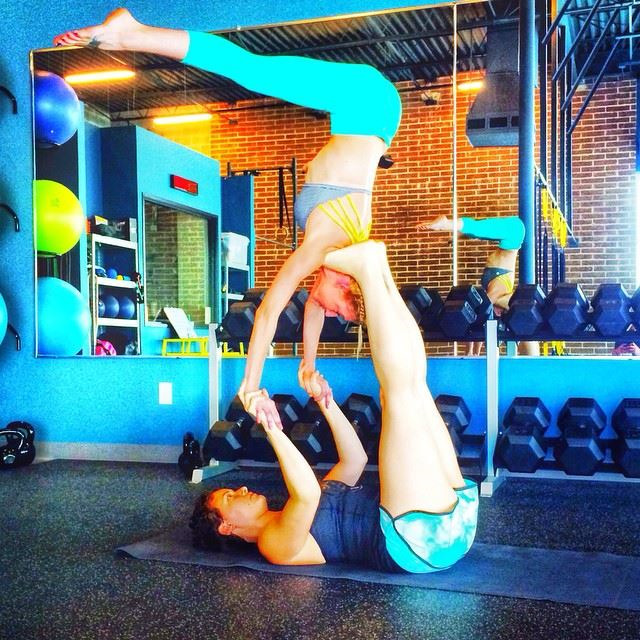 Laura King and Krystal Tronzano will guide you through partner based stretching, movement and assisted relaxation to complete your two hours of fun and flight. Glowga was our very first workshop, so we're excited to bring it back during our anniversary celebration month. Glowga will be our FREE Master Class for April. This class is free for members or $18 for guests. Arrive a few minutes early to take advantage of our glow paint and markers and be ready for a fun night! Every year you set goals, but how well do they typically work out? Join us for this special workshop focused on creating goals that are driven by your values. Discover how to focus your energy on goals and projects that align with what you believe and desire. In this workshop you'll learn how to determine your own core values & create a personal mission statement. When you understand your mission, it's easier to know where to give your energy. Learn the power of the word "no" and to stop giving away your "yes". We'll finish out with a guided yoga nidra practice to set your year off right and you'll leave with your goals set for this year and beyond! These are 3 hours that can change your life. Are you ready? Ever wondered why you feel so good after yoga? Have you heard that yoga can change not just your body, but your mind and spirit? Want to know more about your own subtle energy? This workshop will answer all those questions and more. Join the teachers from our advanced studies (500 hour) program as they lead this two hour workshop on the chakra system and introduce you to the subtle body. This master class includes lecture, active practice and guided meditation. Enjoy the journey within! Turn your world upside down! Learn the benefits, fundamentals and proper alignment techniques in order to defy gravity. Discover how to flip your perspective, build confidence and let go of fears in this playful inversion workshop that is accessible for everyone. Join Lacey as she guides students through poses such as Downward Facing Dog, Headstand, Handstand, Shoulder Stand and more. Find your balance and have freedom in flight! Register here. Join us for a FREE drum circle in the studio on the 10th of April. Bring your drum, shaker or money maker and let's party with abandon! North Texas Yoga is all about creating opportunities to support the needs and desires of our community. So let's enjoy a great Friday evening, open the windows and fill the square with our ecstatic sounds! Join us for our first official class at 8:45am on April 6, 2015! Laura will lead an all-levels vinyasa flow practice to kick off our new schedule of classes.